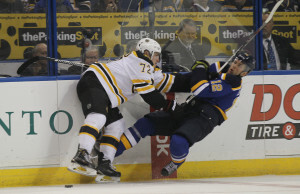 David Krejci had two goals and two assists for the playoff-chasing Boston Bruins in a 6-5 win against the St. Louis Blues at Scottrade Center on Friday. Kevin Shattenkirk scored for St. Louis with 20.7 seconds left with a sixth attacker to make it 6-5. The game ended with the Blues on a power play. The Blues (46-23-9) had a five-game winning streak end. They remained two points behind the Dallas Stars for first place in the Central Division; each team has four games left. Paul Stastny had a goal and assist for the Blues, and goalie Brian Elliott made 18 saves and allowed five goals before being replaced at the start of the third period by Jake Allen, who made four.